In Part 1, we discussed storm damage, which is one of the most common calls we get on the Tree Care side. We also introduced the concept of “ground-to-sky,” which means that as a homeowner, you own the airspace above your property as if the property line was an invisible wall extending straight up from the ground to the sky. Homeowners can generally forgive a tree for overstepping the property line until it starts to cause problems. So what happens when a tree on your neighbor’s property produces living branches that extend across that property line and become a nuisance? In Part 1, we discussed how you can’t rake leaves from your neighbor’s tree back into their yard, and how if a tree that is rooted on your neighbor’s property falls onto your house, it becomes your property once it crosses the invisible property line. It is no different with living branches. 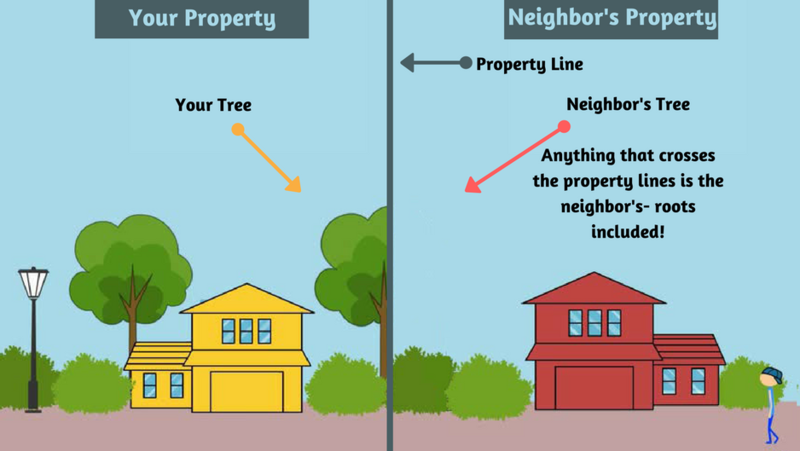 Because the property line goes ground-to-sky, you technically own the portions of the branches that are over your property even if it is part of a living branch attached to a tree on your neighbor’s property. In this situation, you are legally permitted to cut the limbs back to the property line. We call it flat-siding, and it isn’t pretty, and it’s rarely good for the tree, but because the limbs are over your property it is an option. As ISA-Certified Arborists, this is not a technique that we enjoy performing, and when we are required to do it, we take every possible measure to maintain the health of the tree. In these situations, we are the tree’s voice, and we won’t make cuts that will injure the tree or create a decay-causing situation. Less scrupulous tree service providers may come in and perform unhealthy trimming services per your request, but be advised, you are now responsible for the situation you have created with your request. This is yet another reason to rely on ISA-Certified Arborists for their professional expertise. If the tree should fall or die as a result of your trimming decisions, insurance companies will not deem this failure as an “Act of God,” but rather, a situation of negligence on your part. In Part 3, we’ll see how neighbors can work together to find a safe solution that solves the problem while preserving the health and appearance of the tree (which can enhance the curb-appeal of both properties). Just as your property line extends upward through the branches, “ground-to-sky” also extends downward underground to the root system. The tree might be on your neighbor’s property, but its roots can spread as far as one and a half times the canopy’s width. Some trees have root systems that are very near to the surface. These root systems can be unsightly and difficult to mow over. They can even cause damage to sidewalks and driveways. It might be your neighbor’s tree, but once they cross the property line, they are your roots. Here, again, only an ISA-Certified Arborist can determine the number of roots which can be cut without stressing the tree or creating a negligent situation. An ISA-Certified Arborist can select the most advantageous locations to sever the offending roots, providing the best chance of healing for the tree. No two trees are the same, but a general rule of thumb is that one substantial root or two to three smaller roots can be removed per year without creating stress or injury to the tree. Remember, roots need to be removed with care. Don’t just assume that you can tear or rip them out. They will need to be cut cleanly so they can heal faster. Generally speaking, the healthiest place to make a pruning cut is at the union with another root. Improperly cutting off the roots of a tree (say, half of the roots on one side to make room for a sidewalk) creates a dangerous situation for everyone involved. Parts 1 and 2 of this blog have dealt with the negative aftermath of unresolved, property line tree problems. Part 3 will look at preemptive measures that can be taken to avoid these situations in the first place. In most cases, simply being a good neighbor and consulting with ISA-Certified Arborists early in the process can create ideal solutions for you, your neighbor and the tree.